It’s World Osteoporosis Day today so we thought we would pen a quick draft about how some of our clients have increased their bone mass density through careful Pilates practice. Why schedule a day for osteoporosis? Well, this ‘silent disease’ (so called because it’s generally only diagnosed after a breakage) affects one in four women over the age of 50 and one in eight men*. Globally, that’s over 75 million people in Europe, USA and Japan. Osteoporosis, and its lesser cousin, osteopenia, are diseases causing bones to become weak, brittle and prone to fracture. They are not part of normal aging and can be reversed or stabilised. What is normal is that bone density decreases 2-5% per year until the age of 75. But this rate is determined by a number of factors so that if you smoke, are sedentary, have a poor diet, take certain medication, and/or have poor gland functioning, you increase your risk of pathological low bone density. 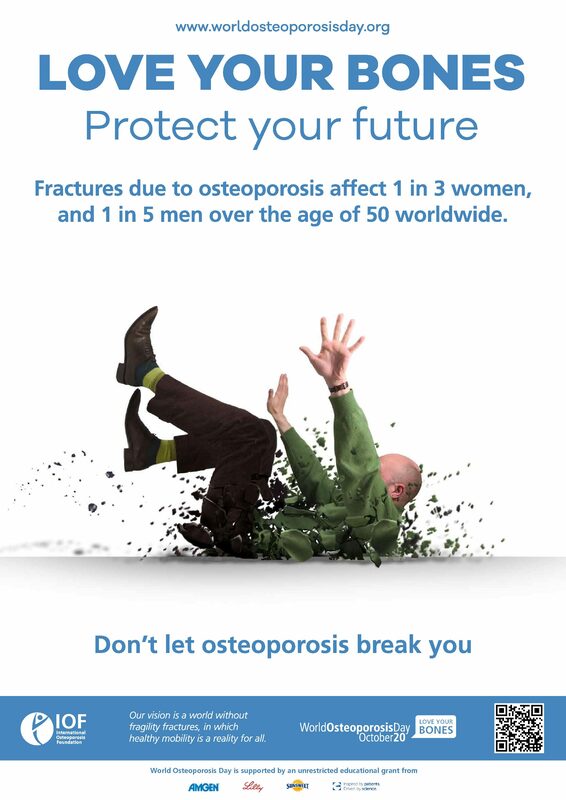 What is interesting is that osteoporotic fractures are almost non-existent in Africa**. To see if you might be susceptible to osteoporosis, try this simple questionnaire, a one-minute risk test from the International Osteoporosis Foundation. Osteoporotic fractures mainly occur in the spine but hips and wrists are also common breakage sites. To fully determine if you are at risk, you are given a Bone Density X-ray or DEXA scan and if your T-score is at or below -2.5 you are at higher risk of fractures. A scary statistic is that 50% of spinal wedge fractures occur spontaneously, for example, through coughing or sneezing***. Osteoporosis or osteopenia can leave you feeling fragile, knowing that just a simple sneeze could cause injury. So an important step to build both your confidence and your bone density simultaneously is to maintain a good exercise regime. Brisk walking daily is encouraged. Bone growth is stimulated through strength training, specifically through short bursts of dynamic loading, so you need weights and movement. Whilst American studies show that jumping as high as you can 20 times a day is more effective than jogging, this may not be suitable if you are diagnosed with brittle bones. On the Pilates Equipment, you can jump without the effects of gravity and you can use weighted spring resistance in a host of gentle movements, including comfortably lying down. Plus, if you can adapt your posture to an optimal S-curve through the spine, you can reduce your risk of fractures and falls. We work hard in One Grove classes to build upper back and abdominal strength which are usually the main determinants in upright posture. If you have osteoporosis, we won’t have you in working in lumbar flexion (the standard sit-up position) but, with the aid of the Pilates Equipment, we can help you strengthen your spine in numerous other ways. Alex, our lovely Pilates expert from Greece, has helped numerous osteopenic clients reverse their decline. In Greece, women are tested every second year after their 50th birthday for osteoporosis, a word itself that comes from Greek origins: ‘osteo’=bone ‘porous’=porous. Working with weights and resistance, Alex’s clients saw a drop from diagnosed osteopenia bordering on osteoporosis to nearly normal bone health. Her clients attributed this partly to the sense of stability and strength that they felt in their bodies from doing Pilates and their ensuing confidence to tackle sports and maintain fitness in other areas of their life. So if you have had a recent T-score result that has worried you, come in and see how we can set you on the road to strength and recovery. We insist that all our osteopenic/osteoporotic clients have a private introductory session with us first so that we can assess you and tailor a workout specifically to you. Then we will advise you which class you might like to attend going forward. A private introduction is £40 for 45minutes or come with a friend for a 55min appointment for £25 each. For more information, email us or call 01242 255111. Our reception is open Mon-Fri 0845-1245 so do feel free to pop in then to have a chat. You will find more about us on our website www.onegrove.co.uk.